Brent Knoll, Somerset, TA9 4BB. We are located within easy reach of Junction 22 of the M5 Motorway. Leave the M5 at Junction 22 signposted Burnham-on-Sea. At the roundabout take the 3rd exit marked A38 Bristol. After 0.6 miles turn left onto Brent Street, signposted Brent Knoll. 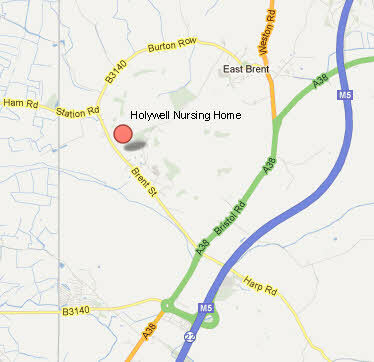 Travel a further 0.9 miles and to your right you will see the white sign for Holywell Nursing Home. Parking available.